DinkNeSmith.com: What if Hermine had been Katrina’s twin sister? What if Hermine had been Katrina’s twin sister? To be a tiny two-letter word, “if” carries such a B-I-G impact. If a bullfrog had wings, it wouldn’t bump its tail when it hopped. In 1993, if Wayne County commissioners and the solid waste authority had just heeded the initial geology reports, there wouldn’t be a landfill in Broadhurst, which was—in great detail—deemed unsuitable. Instead, the Georgia Environmental Protection Division (EPD) allowed some engineering modifications—despite the scientific warnings—and now we have a toxic coal-ash crisis. Already, Republic Services, owner of the private landfill, has dumped an estimated 800,000 tons of toxic coal ash on us—courtesy of weak laws and the out-of-state Jacksonville Electric Authority. We’ve already experienced one toxic heavy-metal leak or spill. And now, Republic wants to trample more crucial wetlands to railroad-in up to 10,000 tons of coal ash per day. Why the EPD didn’t protect our sensitive ecosystem is a mystery. And why was the United States Army Corps of Engineers silent during all of this? The geologist all but screamed: “Don’t do it!” The high water table and cypress trees should have signaled to the Corps that Broadhurst is wet, wet, wet, as in protected wetlands. Hurricane Hermine blew through, dumping inches of water on us. Mother Nature just delivered another reminder that Coastal Georgia is vulnerable. What if we had mountains—millions of tons—of toxic coal ash stacked in Broadhurst? And what if Hermine had been Katrina’s twin sister? I understand that coal ash has to be stored somewhere, but why put the toxic materials in such risky places? Coal-burning utility companies should not be allowed to solve their problems by creating problems for others. Why let them send what they don’t want to unsafe places where the people don’t want it? Wayne County’s coal-ash issue is more than a Broadhurst problem in Coastal Georgia. 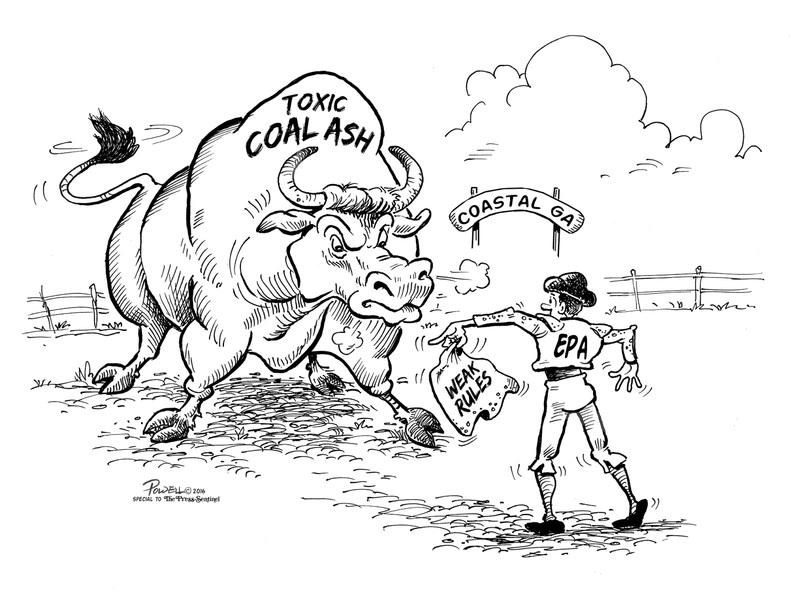 The EPD and the Department of Natural Resources boards need to postpone their decision on the proposed coal-ash rules. This should be vetted in the 2017 session of the General Assembly. With one of the largest deposits of toxic coal ash in the nation, Georgia needs to be the leader in proper handling and storage. If we don’t benefit from hindsight and get it right this time, future generations are going to be like the proverbial bullfrog. Our great-great-great-grandchildren and their grandchildren will be bumping into toxic coal-ash pollution for eternity.